Mental Crush is not just one of the main HardTechno names from Poland; many consider him as the best polish producer of this style nowadays. AudioCode?s newest EP ?Specific frequency? features 4 dancefloor cracking tunes from the young producer. And, to highlight even more this new release, we completed the EP with a remix that is definitely out of the ordinary, by the label owners Lukas & Fernanda Martins! 'Give Me A Dub Plate' definitely brings a lot of energy to the crowd! Its dub elements and vocals call and prepare everybody for what is coming next: a delightful and powerful 'loop' very typical from Mental Crush. 'Let's Party' has very well marked line of percussions in the main loop, and elements that create a mysterious sensation. The wobble synth in the break, and the vocals, are the main features to highlight about this tune. 'Specific Frequency' gives name for the EP and it couldn?t be different, as this track has all the characteristics that explain how Mental Crush feels HardTechno: a lot of percussion changes to give dynamics, power and energy to the dancefloor. 'Double Wobble' is the perfect choice if your idea is to give a break and a time to the crowd to take a little breath. But do not get it wrong, the entire introspective environment, generated by the combination of synthesizer layers, suddenly changes and bring them back to the power of HardTechno. 'Give Me A Dub Plate' Remix - Lukas & Fernanda Martins prepared a remix that will blow up the minds of any hardbeat lovers. Faithful to the original version because of its vocals and synth, the remix comes with a texture that reminds you very well who is the couple behind it; specially thanks to its powerful and dynamic 'loop' and the unmistakable little cuts, off beat rolls and fills. 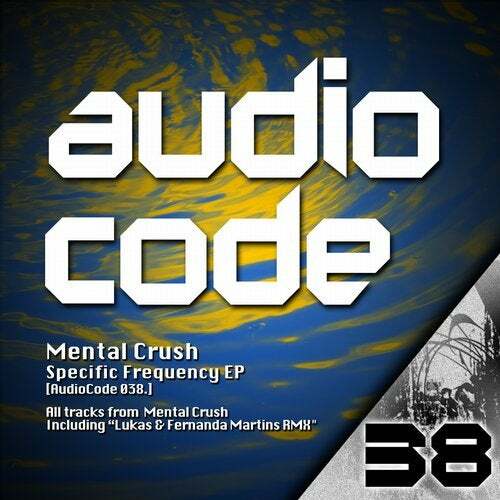 You definitely cannot miss 'Specific frequency' EP by Mental Crush on AudioCode Records!